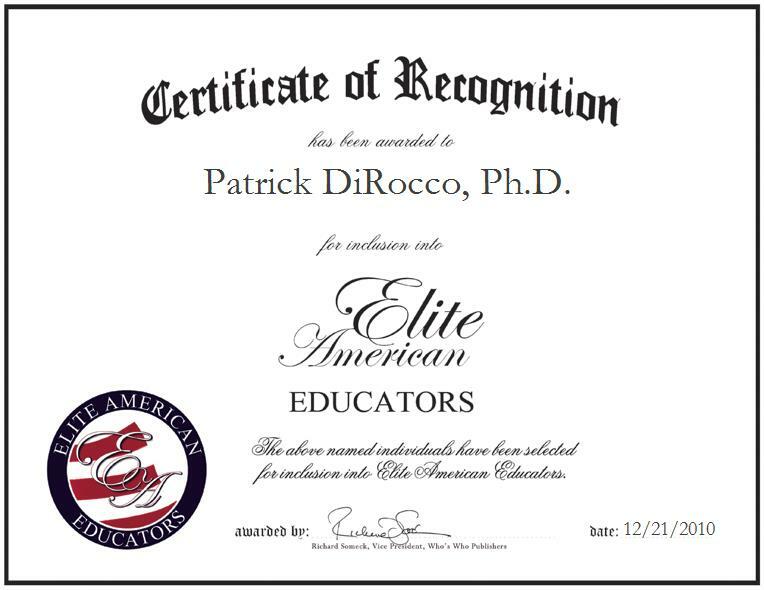 La Crosse, Wisconsin, December 21, 2010, Patrick DiRocco, Chairman of the Department of Exercise and Sport Science at the University of Wisconsin-La Crosse, has been recognized by Elite American Educators for dedication, achievements, and leadership in higher education. For Dr. DiRocco, the best part about his professional career is having the opportunity to develop programs for the disabled. By working with handicapped students for the last 35 years, he has witnessed the benefits that come along with physical activity, and has used that knowledge to focus the curriculum around the quality of life. As chairman, Dr. DiRocco is pertinently responsible for managing the department and participating in faculty committee activities. A graduate of the University of Oregon, Dr. DiRocco earned a Ph.D. in 1975 to catapult his interest in sports and education to become a thriving career. Further, Dr. DiRocco maintains affiliation with the American Alliance for Health, Physical Education, Recreation and Dance in order to expand his own knowledge and learning; he truly is of the belief that one can never know too much information about anything. With an aspiration to retire and pursue work as a consultant, he advises those emerging in the industry to sharpen their listening skills, nurture their patience and employ their work ethic – for Dr. DiRocco, these small words of wisdom brought him a career adorned with gratification and success.